You are purchasing the stove, legs & pipe. 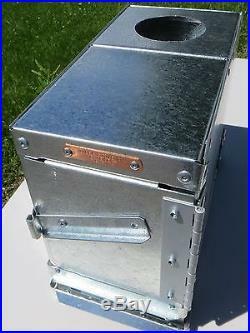 This stove is a little smaller than the Flap Jack & was designed especially for the Backpacker, but of course can be used anywhere you need a small stove for heat or cooking. The Baby Eagle is light weight (only 4 lbs) sturdy and compact, the legs are easily removed for transport. 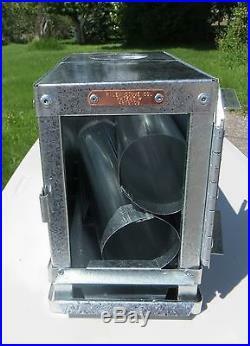 The fire box measures 6″ W x 9″ H x 12″ L (with a 3″ chimney hole). 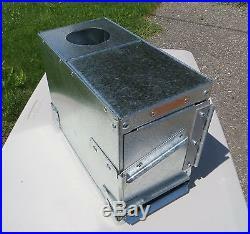 Heats a small tent or ice fishing house very easily and holds heat for one to two hours. This package includes 2 pieces of pipe 3″ x 8″. This stove is not set up for a shelf or water tank, if you wish to ad these later you will have to install the rails and brackets yourself. Riley Stoves are quality constructed for a lifetime of satisfaction featuring. Galvanized steel for rust prevention (18 – 24 gauge). Non-warp top will support 300 lbs. Double air cooled bottom. Light weight for ease of transportation. Nesting system – everything fits inside the stove. Large draft for easy lighting. Used and approved by the USFS. Riley Stoves Make a. To Meet Every Need. Has been building the finest outdoor wood stoves since 1982 in Townsend. Have been used by packers for many years and have gained high respect for their durability, longevity and flexibility. Riley camp stoves are lightweight, have an airtight design and the capability to store all the accessories (water tank, stove pipe, shelf and legs) inside the firebox. 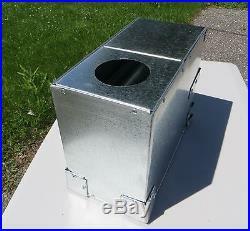 All Riley Stoves are constructed from galvanized steel and come with double insulated bottoms that will not burn out. Some camp stove models even hold heat for up to eight hours! They are easily maintainable, packable and transportable. Offering the ultimate in outdoor wood stoves, Riley Stoves has the answer to your cooking, baking, heating and hot water needs in the backcountry. So which size Riley camp stove is right for you? The information below is for comparison purposes only, all of these stoves will be listed separately with different kits. Perfect for smaller Wall Tents and Spike Tents, the Little Amigo is lightweight and sturdy. 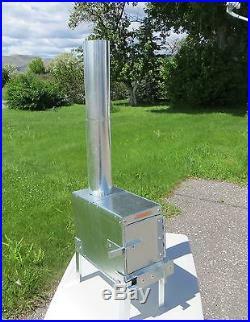 This outdoor wood stove is large enough to feed 2-3 people and still pack inside a pannier. 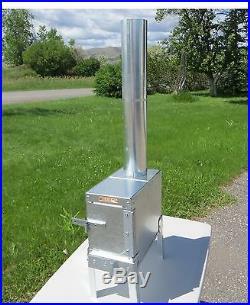 Riley Stoves Side Kick is the most packable size stove with the large camp stove conveniences. 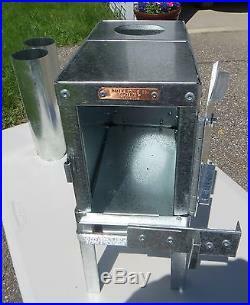 This outdoor wood stove can easily feed 3-4 people, heat a small to medium sized Wall Tent and still be packed inside most panniers. 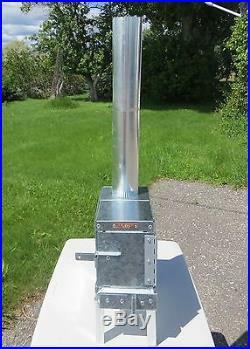 The Colt is Riley Stoves most compact large model outdoor wood stove. 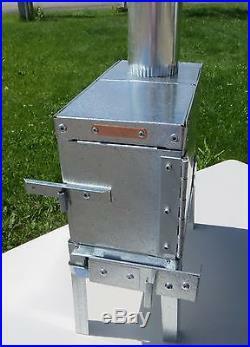 This stove can feed 4+ people and heat a medium to larger sized wall tent through the night with minimal stoking. 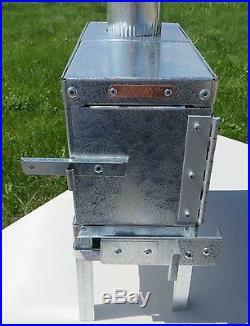 One of Riley Stoves most popular models, this outdoor wood stove will feed a small group, heat a large tent and hold a fire approximately 6-8 hours. Heats Tent up to. 7″ x 9″ x 15. 11″ x 10″ x 18. 13″ x 10″ x 22. 11″ x 13″ x 22. 16″ x 10″ x 26. 16″ x 13″ x 26. 18″ x 13″ x 28. So, no matter how big (or small) your tent is or how many people you need to feed once you make camp, Riley Stoves has designed a camp stove that will meet all your needs and exceed all your expectations of an outdoor wood stove. We specialize in hand-made gifts from. And other western states. The above item is just a sampling of the many items that we offer. Please check out our. DO NOT PAY UNTIL YOU RECEIVE AN UPDATED INVOICE. If you are purchasing multiple items, I will group these items into one package when possible. The free listing tool. 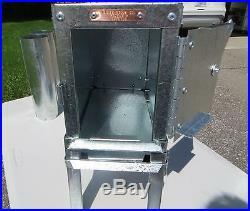 The item “Baby Eagle Backpacker Wood Camp Tent Stove Riley Stoves” is in sale since Friday, May 10, 2013. This item is in the category “Sporting Goods\Outdoor Sports\Camping & Hiking\Camping Cooking Supplies\Camping Stoves, Ovens & BBQs\Camping Stoves”. The seller is “jackfarm” and is located in Townsend, Montana. This item can be shipped to United States.